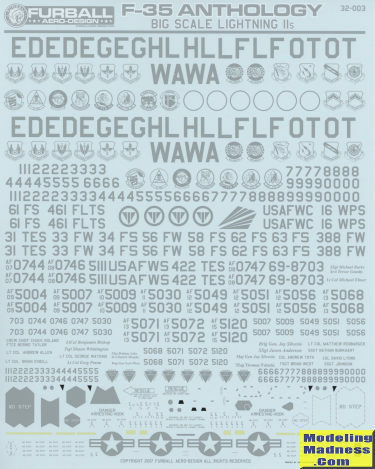 Furball Aero Design's third 1/32 sheet is for the Italeri 1/32 F-35A. After a very rough start, the uber-expensive F-35 program has been picking up steam. By 2014, the program was "$163 billion over budget [and] seven years behind schedule." Software glitches have plagued the aircraft and last year it was reported that fixes have been made to where it now crashes only "every 8-10 flight hours". Current average cost of all F-35s is around $100 million dollars an aircraft with the B and C model being higher. It is probably not surprising that this is the most expensive weapons system program ever. The photo at the top is of an 34 FS plane serial 15-5093 in case you want to model a fairly new plane. It seems that all the new build planes are going to the 56th and 388th FW. The sheet is, understandably, all shades of grey for the markings. It includes sufficient data markings for one aircraft, but those wanting to do more can easily use those included in the kit. Unlike the F-15 and such, the F-35 is quite light on data markings. 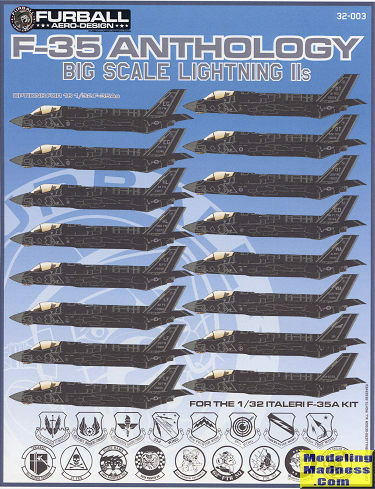 The sheet also provides a goodly number of numbers so that you can duplicate pretty much any F-35A currently in service. Cartograf printed this sheet so you know you are getting the best. Furball has provided an excellent set of placement diagrams that includes a bit of additional info on each of the aircraft. In all, an excellent sheet for those who like to model big.